SKU: TO-CERSTAG-J. 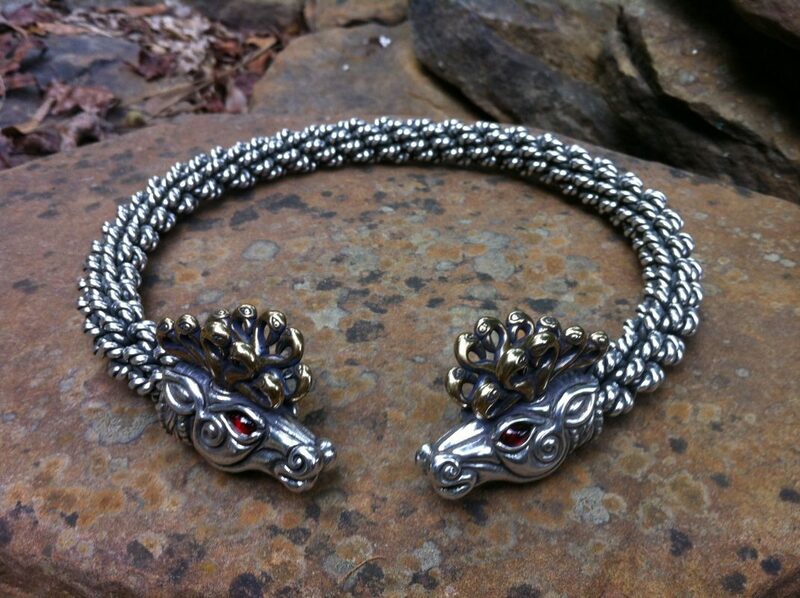 Categories: Torcs, Jeweled Silver Torcs. 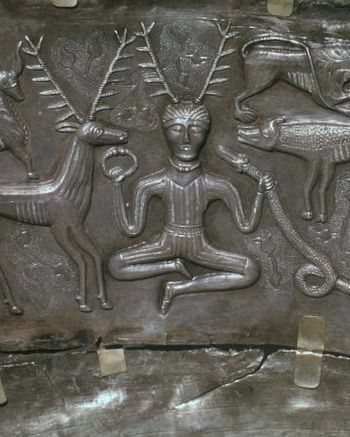 Since the 4th century CE, there have been legends of a Celtic god named Cernunnos that had the antlers of a stag protruding from his head, holding a torc in his right hand, and a horned serpent in his left. Our Stags of Cernunnos Torc is constructed with an extra heavy braid of wire, and is approximately 5/8 inch (16mm) thick. It has a sterling silver braid, a bronze head with a silver antlers, and is set with your choice of blood-red garnet, regal amethyst, pale blue topaz or golden citrine for its eyes. 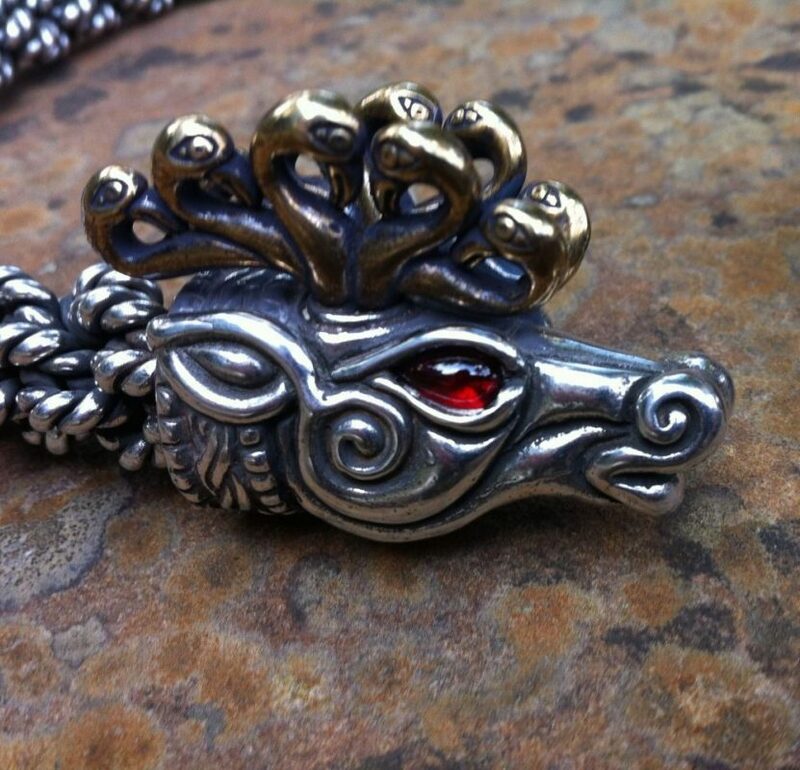 We offer two versions of our Stags of Cernunnos Torc: plain and jeweled. We also offer three lighter styles of Stag Torc: medium and heavy. Cernunnos was a mysterious Celtic god. He was often portrayed with a beard, wild shaggy hair, and mighty antlers. He wore a torc, and was often holding one as well – In Celtic art, wearing a torc indicated that the wearer was a god. He was connected with male animals, particularly the stag, and was almost always accompanied by a stag and other animals, and a horned serpent, who was a god in his own right. The forest was his domain. As a god of the forest and animals, Cernunnos may have been evolved into the later Medieval Green Man. There are also parallels between Cernunnos and the Greek satyr Pan. Cernunnos was a god of rebirth and renewal as well as nature. With his antlers, he is reminiscent of the representations of stags in the art of the Scythians, neighbors of the Celts to the east. To them the stag represented reincarnation, and they always portrayed stags at the moment of death, its legs bent underneath, often with elements of its body becoming new creatures. In particular the antlers were often seen turning into birds. We borrowed this element of Scythian art, which we felt was correct for this design. Cernunnos was the Master of the Hunt. It is very likely this notion evolved into the later Wild Hunts of the Saxon god Woden and the Norse god Odin. In the Saxon and Norse (and later) tellings of the Wild Hunt, the leader of the hunt would emerge from the underworld, accompanied by an unearthly horde of hounds and men. They would go hurtling through the night sky, their passing marked by a tumultuous racket of pounding hooves, howling dogs and raging winds. Their quarry was usually a great boar, but sometimes might be a white stag, a wild horse, a terrified man or even a magical maiden. But no matter, the appearance of the hunt was almost always regarded as a bad omen, foretelling of a period of strife, famine or death. These traditions probably gave rise to the legend of Herne the Hunter in English folklore. According to legend, Herne was a huntsman employed by King Richard II. Other men became jealous of his status and accused him of poaching on the King’s land. Falsely charged with treason, Herne became an outcast among his former friends. Finally, in despair, he hung himself from an oak tree which later became known as Herne’s Oak. It is said Herne rose from the dead to become a divine hunter, engaging in wild hunts carrying a great horn and a wooden bow, riding a mighty black horse and accompanied by a pack of baying hounds. Mortals who get in the way of the Wild Hunt are swept up in it, and often taken away by Herne, destined to ride with him for eternity.